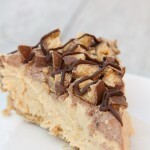 I’m so excited to share this no-bake peanut butter Twix pie with you because it was SO good! It’s probably one of the better desserts I’ve ever made and for sure the very best pie I’ve ever made. It was rich and creamy and I love anything with peanut butter and chocolate so this was perfect. The best part is it was super simple to make and didn’t call for many ingredients. All you’ll need is shortbread cookies and butter to make a simple and perfect crust filled with a mixture of peanut butter, cream cheese and Cool Whip. On top of that you will add another scrumptious layer of Cool Whip and chocolate. You can leave the pie like that, but we loved it with chopped up Twix and melted chocolate on top. The Cool Whip in the peanut butter mixture makes it so light and creamy. You will have a hard time not wanting to eat the whole bowl of the mixture before actually getting it into the pie crust. I made this pie while my kids were at school and surprised them when they got home with a fun after school treat. They love Twix and they thought this dreamy pie was way better! It made homework time a lot more pleasant and put everyone into a great mood. I hope you enjoy this pie as much as we did! It’s hard to not love a dessert that is easy to make, doesn’t take long and only calls for a few delicious and creamy ingredients. It’s pretty much perfection!